The Wiegands: a yummy recipe. I have a new contributor that I am so excited to introduce today. I have had her on here before and she has the most fabulous recipes! Recipes aren't my strongest areas. So I have been thinking about pulling on an official recipe contributor for awhile that would bring you guys weekly meals and recipes! I finally decided to reach out and ask sweet Kelly from Eat yourself Skinny if she wanted to come on board and do this with me. She said yes! I am thrilled! She has become a sweet friend of mine and I adore everything she makes. Not only that but she takes beautiful pictures of her food and being a visual person this instantly drew me to her blog! So, meet Kelly...she'll be here once a week sharing with you all! "During the summer months, I LOVE a good salad. I mean they're healthy, bikini friendly and sure know how to hit the spot on a hot July afternoon. 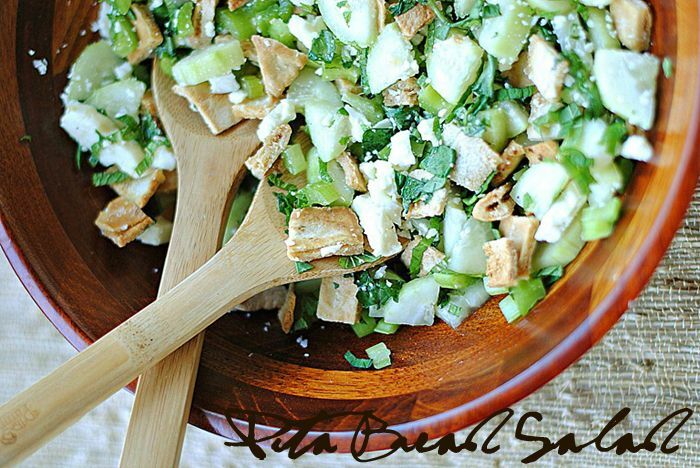 This particular salad mixes crunchy pita bread, crisp cucumber and sweet mint altogether with a delicious white wine vinaigrette that will simply make your heart swoon. I'm such huge fan of really crisp salads, not ones that wilt the second you throw some dressing on them. And the great thing about this salad is the leftovers stay fairly crisp if you want to bring your extras to work the next day! One suggestion would be to save a few of the baked pita squares and throw them in a baggy to take with you so they don't get soggy overnight. Oh and you know the best part?? You really can make this salad all your own! 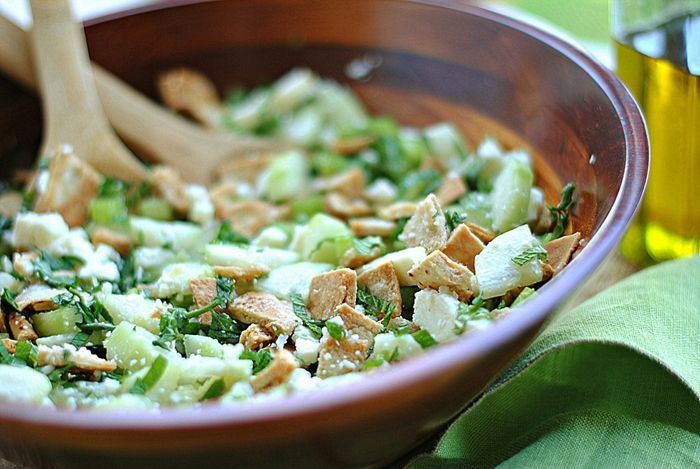 Throw in some lettuce, chopped veggies or even toasted almonds for added flavor. The possibilities are endless, but your waistline will never know." Preheat oven to 350 degrees F. Spread pita squares on a baking sheet and bake until they are nice and crisp, about 15 to 20 minutes. Remove from oven. Meanwhile, in a small bowl, whisk together vinegar and olive oil, and season with salt. 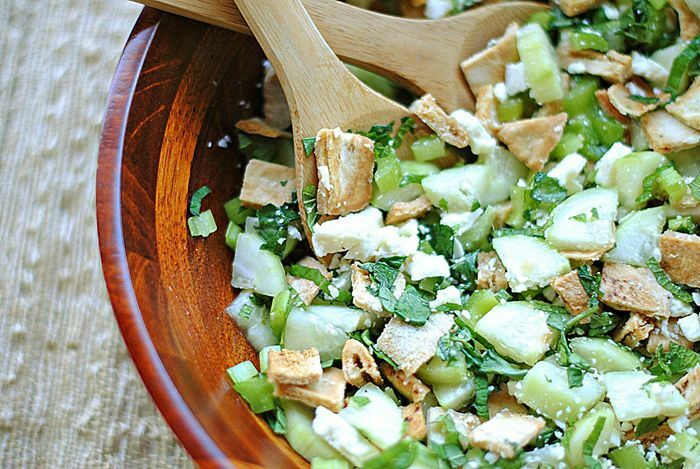 In a medium salad bowl, combine toasted pita bread, celery and cucumber. Add vinegar mixture, and toss well to combine. Just before serving, add mint and watercress and gently toss again. Sprinkle feta cheese over the top and season with pepper.